I am not sure I can fully express how much I love the food associated with autumn. I love comfort food, I love butternut squash, chilis, pasta and I can’t even get started on Thanksgiving in general! I have re-discovered a long lost favorite recipe this fall, which made everyone in my house very excited. 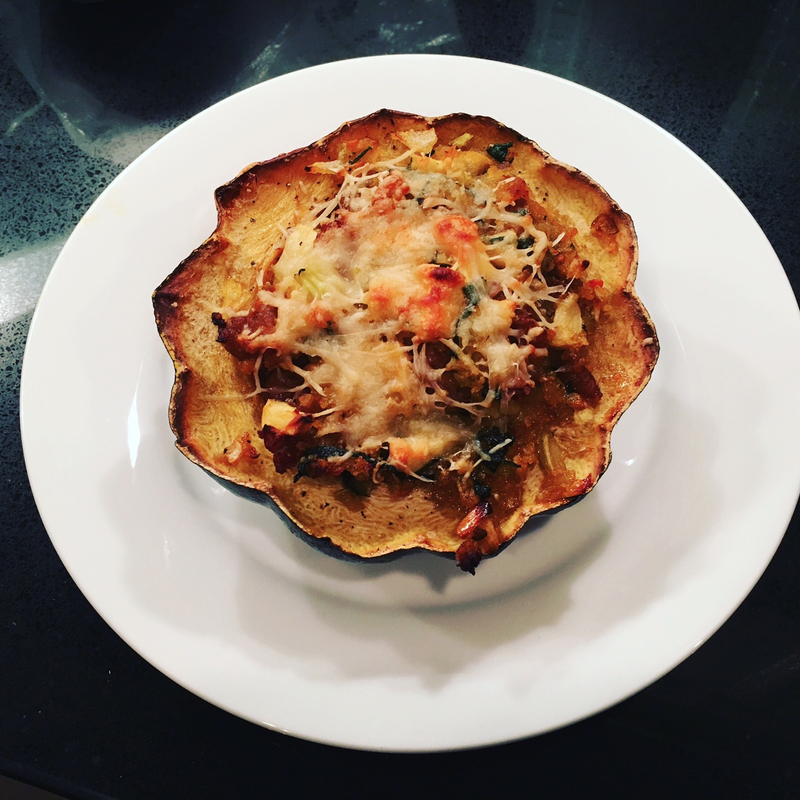 I made this special stuffed acorn squash on a Friday night after a pretty long work week. I dug deep down to get enough energy to battle traffic AND stop at the grocery store after work on Friday… and as I was in the kitchen later that night, sipping a glass of wine and scooping out the seeds of my acorn squash, I was so glad I had gone the extra (few) miles to get what I needed to make this dinner. Before I started cooking, I preheated my oven to 400 degrees. To make getting into my acorn squash a little easier (it is never truly easy to get into the middle of a squash) I cut off both ends of the squash. After that I was able to cut my squash in half (although far from perfectly. I gave SC the bigger half!) I put my squash on a foil lined baking sheet and then drizzled with a table spoon of oil. I added a pinch of salt to each side, and a good amount of freshly ground pepper. 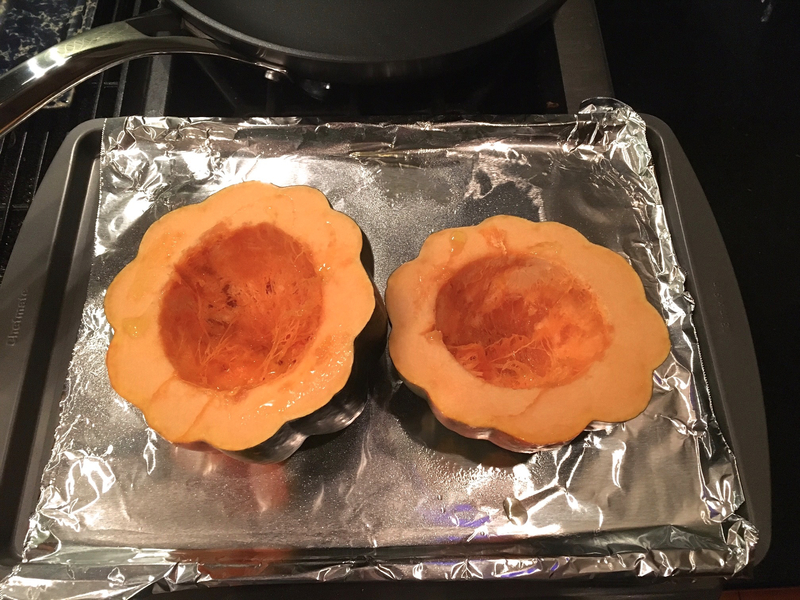 I popped the acorn squash halves into the oven and cooked them for 40 minutes at 400 degrees. While the squash was cooking, I chopped up a small Vidalia onion, a medium apple and a stalk of celery I minced a couple of cloves of garlic. I also chopped up two cups of spinach. I heated 2 teaspoons of olive oil in my skillet and once the oil was hot, I added the onion and celery. Once the onion was soft, I added two hot Italian sausage links (casing removed) and the garlic. I cooked until the sausage started browning, stirring frequently. I added a pinch of rosemary. Then I added the apple and spinach. About two minutes later I added half a cup of Panko breadcrumbs and 1/2 a cup of shredded parmesan cheese. 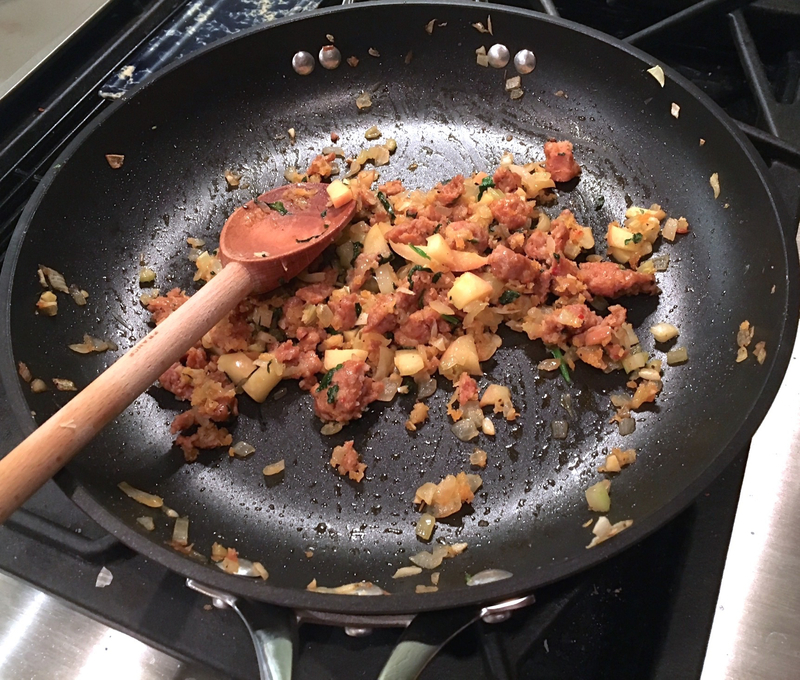 Once the squash was finished cooking, I took it out and stuffed it with the sausage and apple mixture. I sprinkled more shredded cheese on top and popped it all back in the oven for 20 minutes. The end result was crazy delicious!! It was also a big hit with SC who had yet to enjoy this meal. We will definitely be making it again soon… we even have an acorn squash on our counter, just waiting for the next opportunity to make this recipe – I can’t wait! That looks really yummy! Gotta go get a squash and try it! I like squash but I’m not very inventive with how to fix it. This will be a meal this week at our house! Thanks.